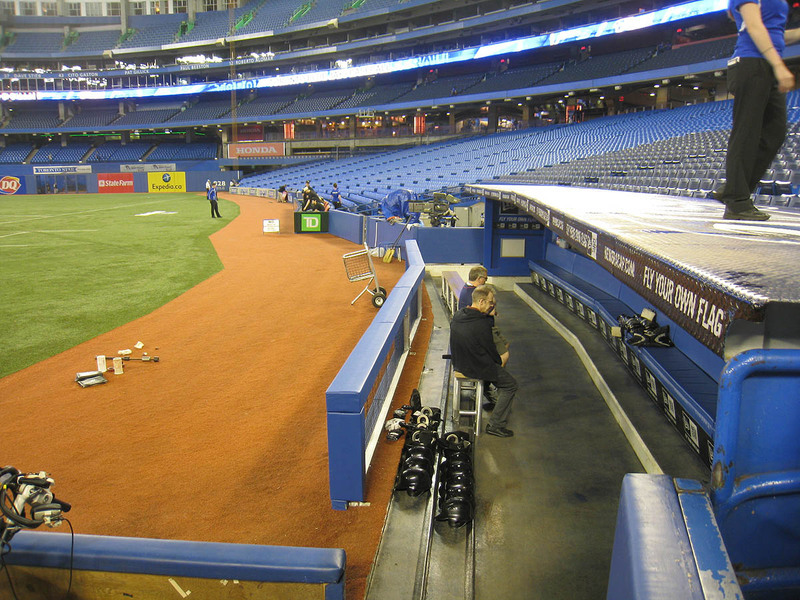 In Toronto, the visiting team occupies the 1st base dugout. 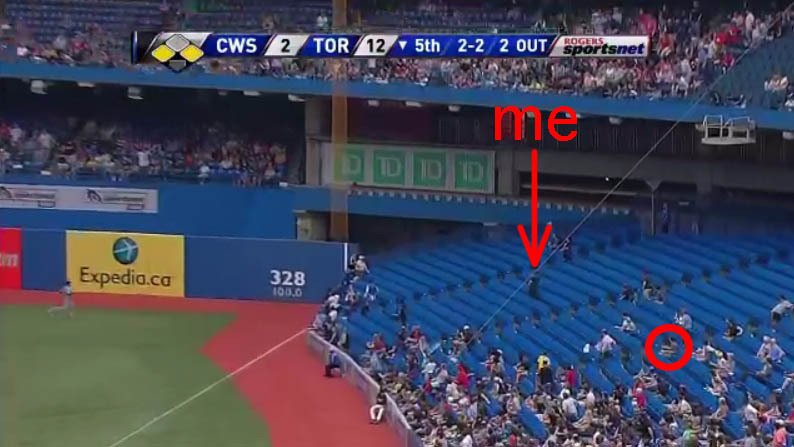 I decided to hang out there for a few minutes in case Alex Rios poked his head out. I’d gotten my 5,000th ball from him the day before — click here to watch the video of me catching it — and I really wanted to get it signed. 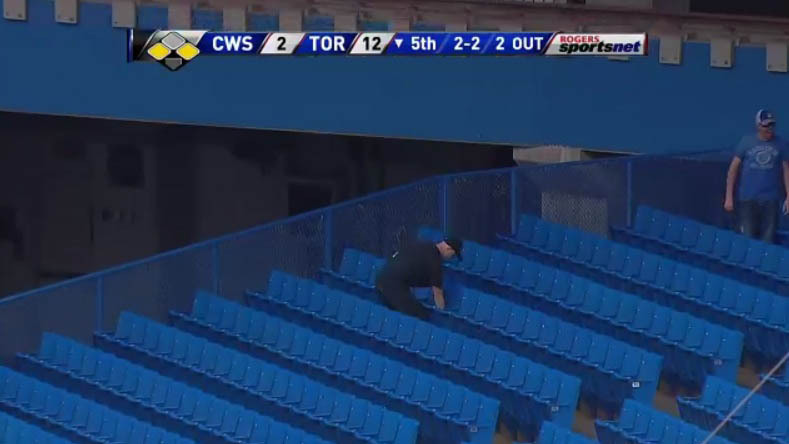 Rios, however, was nowhere to be seen. …and it just so happened that he fielded a batted ball in between throws. I asked him for it. He tossed it to me. Easy. “Okay,” I said shakily, startled by what had just happened. 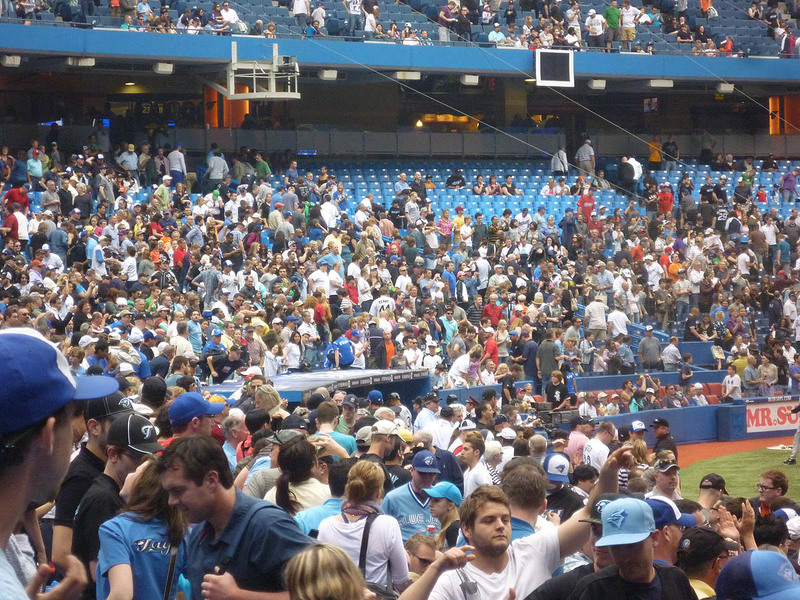 That’s what the outfield looked like forty-five minutes after the stadium opened — on a Sunday! 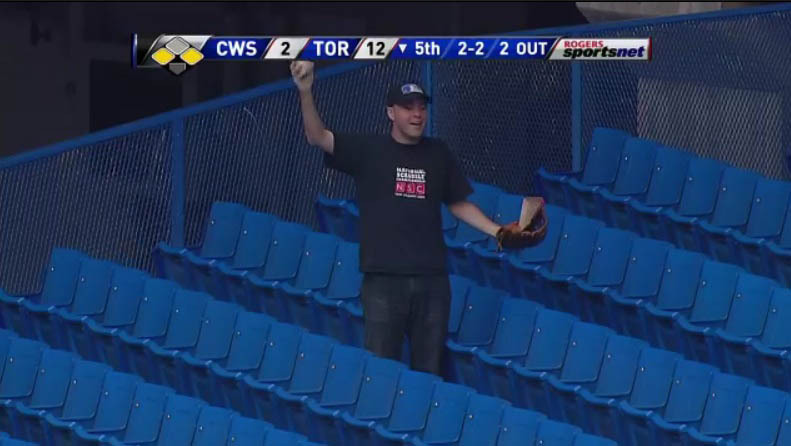 Anyway, I caught two home runs on the fly, and the photo above shows how far I ran for the first one. 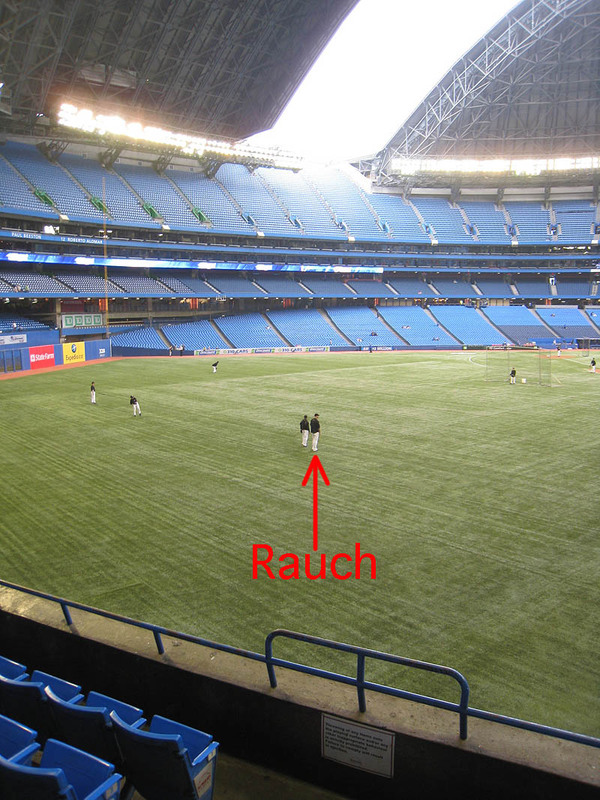 The arrow on the bottom shows where I was standing when the ball was hit. 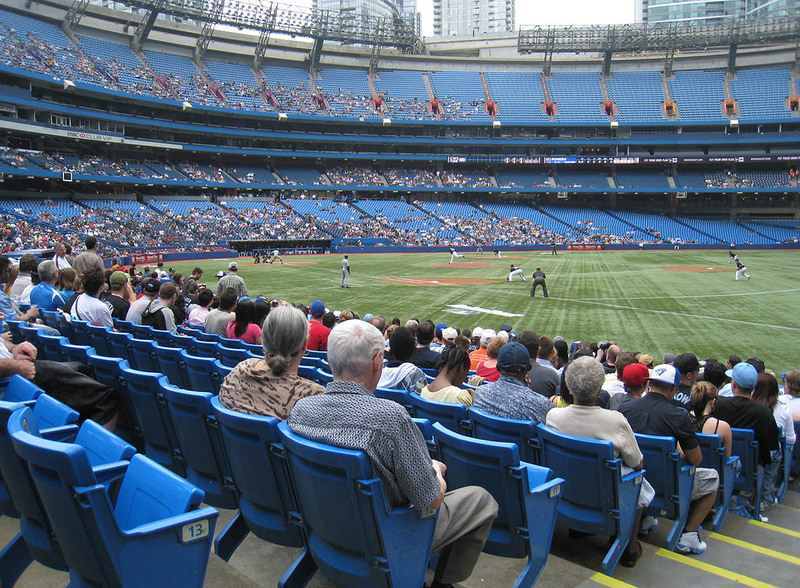 Now, do you see the “red seat” in the next section? It’s in the 3rd row on the far end of the next staircase. That’s where I caught it. 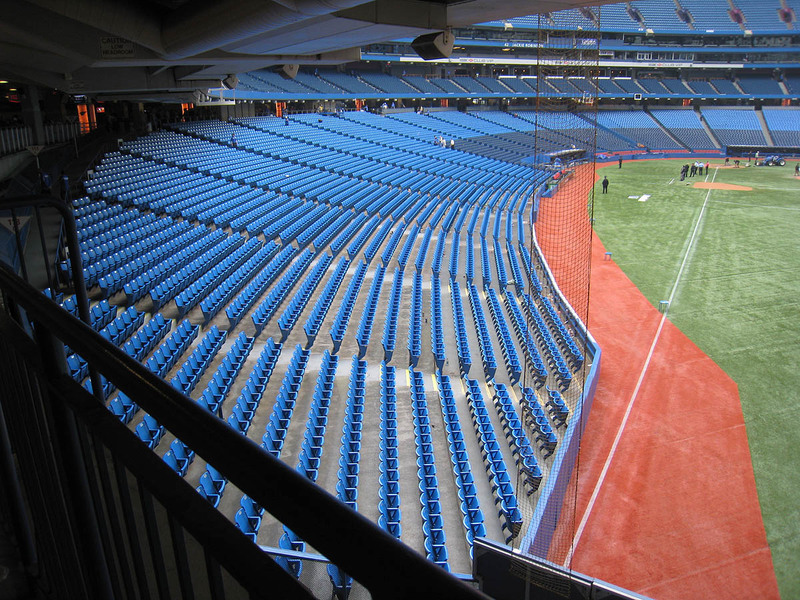 While the ball was in mid-air, I ran the entire length of my 22-seat section, then navigated around the big concrete step, ran an additional five seats, and reached high up for a back-handed grab. There wasn’t anyone else going for the ball — those guys in the front row just stood there and watched — but it still felt great. 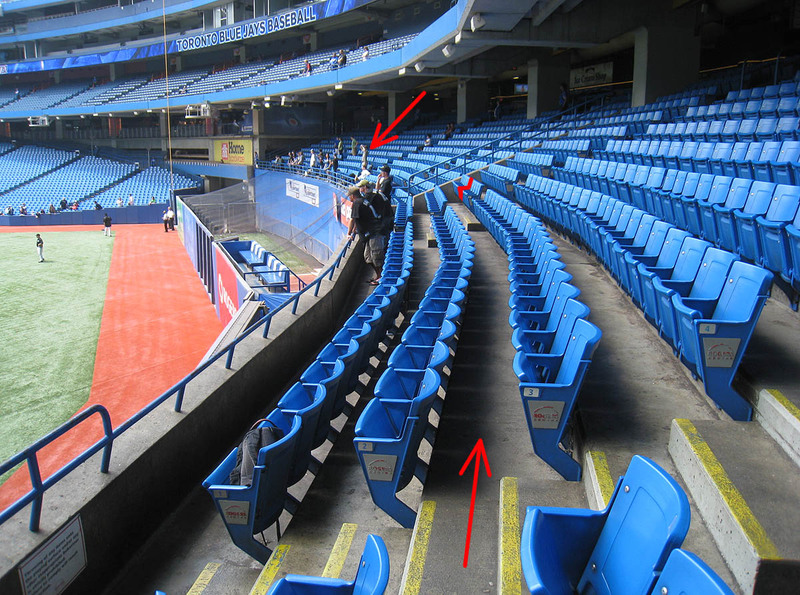 As for the second homer, it was hit in my direction but falling short, so I drifted down the steps and reached over the railing for it. 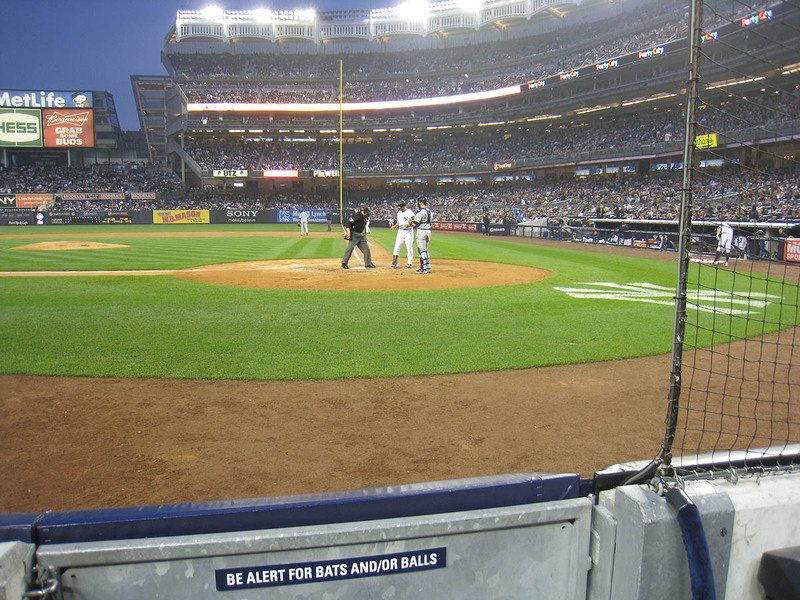 Unfortunately, I don’t know who hit either of these balls. 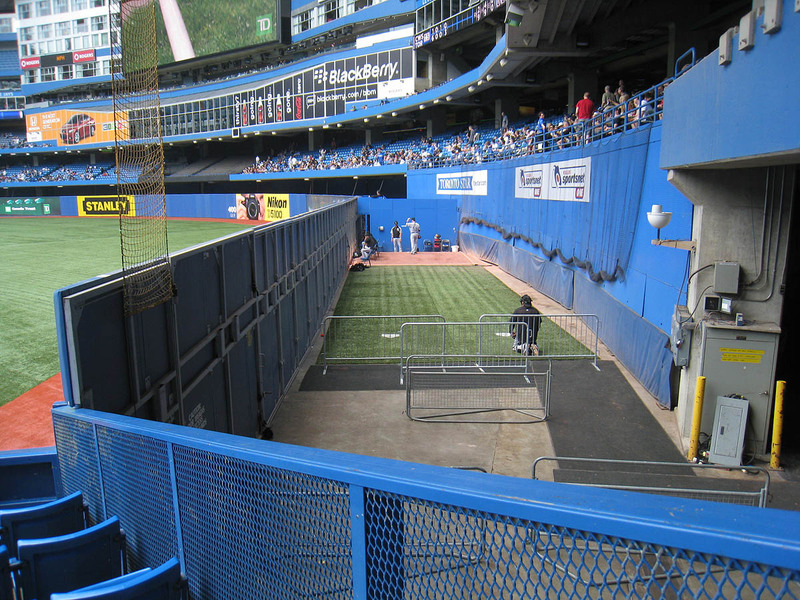 Do you see the arrow pointing to a fan behind the bullpen? That’s my friend Andrew. (He’d made this trip with me from New York City.) When BP ended, I had six balls, and he had five — pretty impressive considering he’d only snagged a total of five in his entire life before that. His first two baseballs of the day were tossed before BP started. 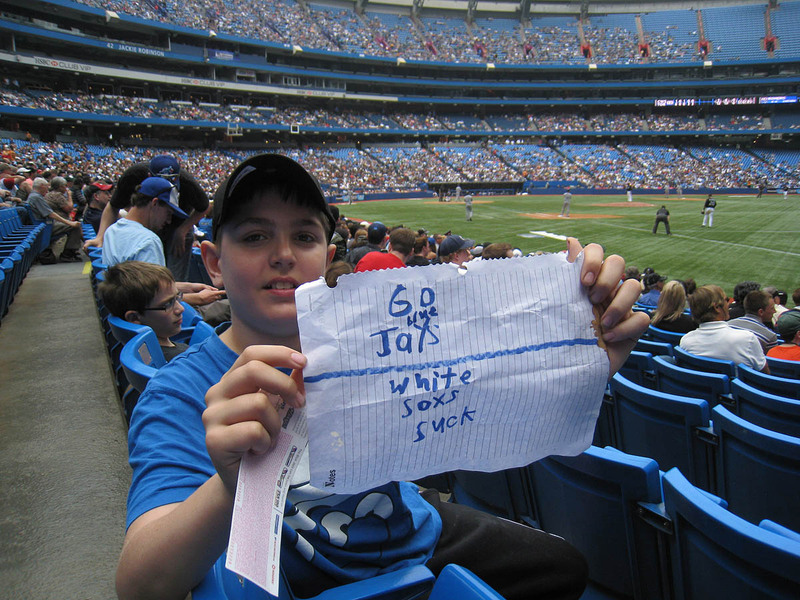 During BP, he got Marc Rzepczynski to throw him another, then caught a home run on the fly, and finally grabbed another homer in the seats. I screamed my head off and tried to get his attention, but he ignored me and cut across the infield to get back to the dugout. Does anyone have advice for getting him to sign? 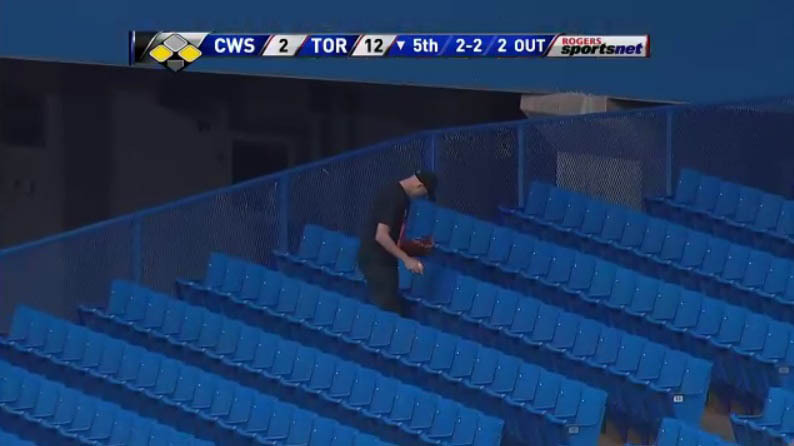 Does he ever sign inside stadiums? Does he sign on his way in or out? Does he sign at the hotels? Does he ever sign for anyone under any circumstances? Do I need to be blonde and have large breasts? (Anything is possible nowadays.) Seriously, WTF do I need to do in order to get that man’s autograph on my 5,000th ball? Should I mail the ball to him with a SASB? (That would be a self-addressed stamped box.) Should I contact his agent or the White Sox? Should I wait until Rios retires and then pay some excessive fee to get him at a card show? I’ll do whatever it takes (as long as it’s legal). 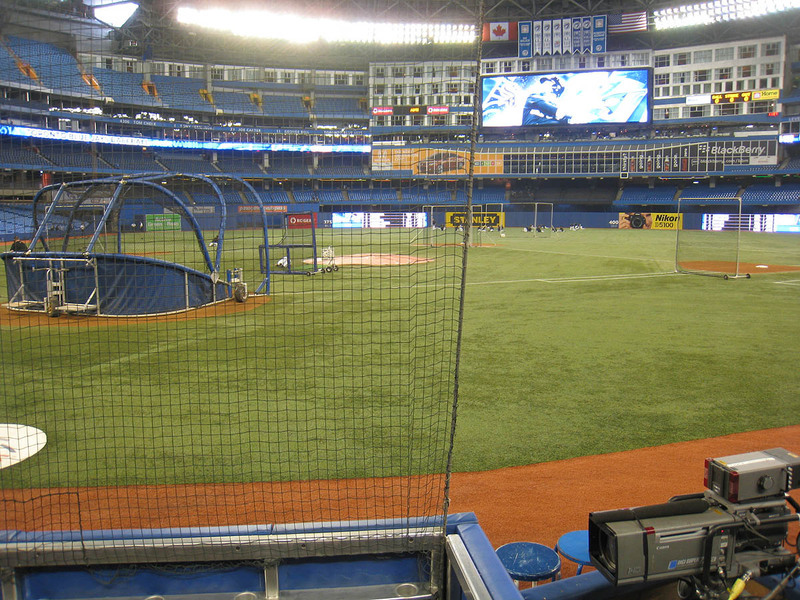 Soon after Rios blew me off, I got Alexi Ramirez to bounce-pass a warm-up ball to me off the fake grass. The pitching matchup featured two lefties — John Danks versus Ricky Romero. Of the 18 batters in the starting lineups, 15 were right-handed! 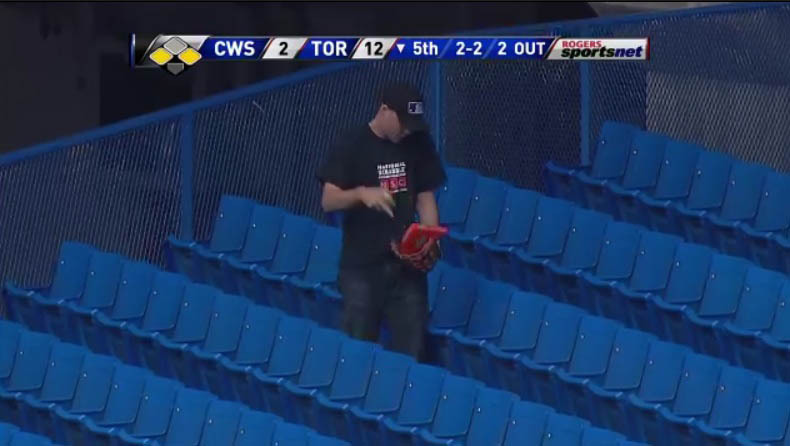 I just needed one of them to swing late and slice a foul ball down the line. Just one. Was that too much to ask? 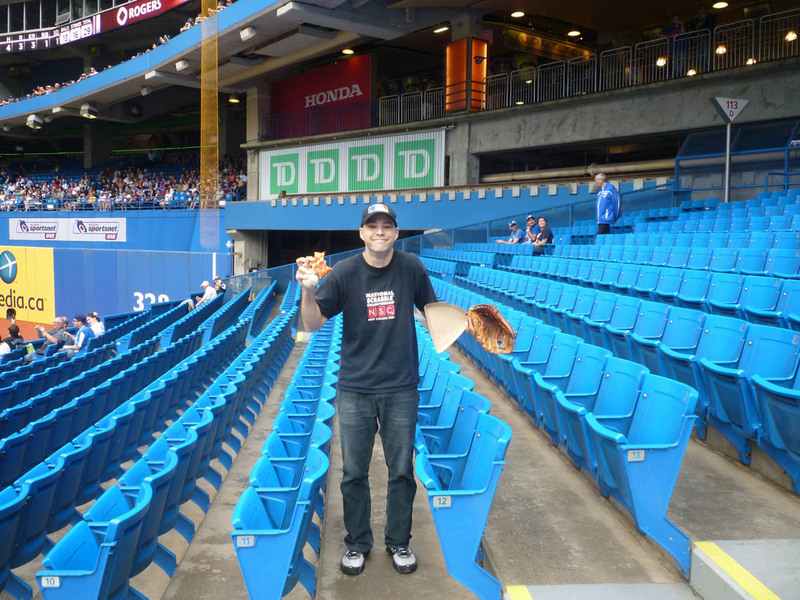 In the top of the 5th inning, Andrew went to get pizza — once slice for each of us — and in the bottom of the 5th, he came back with it. I started eating, but I was still paying close attention to the game, and I was ready to pounce. Can you tell where I’m going with this? There was grease and tomato sauce on me — not enough to appear on camera, thankfully, but enough for me to be annoyed. People are so nice in Canada. You’d think it was like…another country, or something. 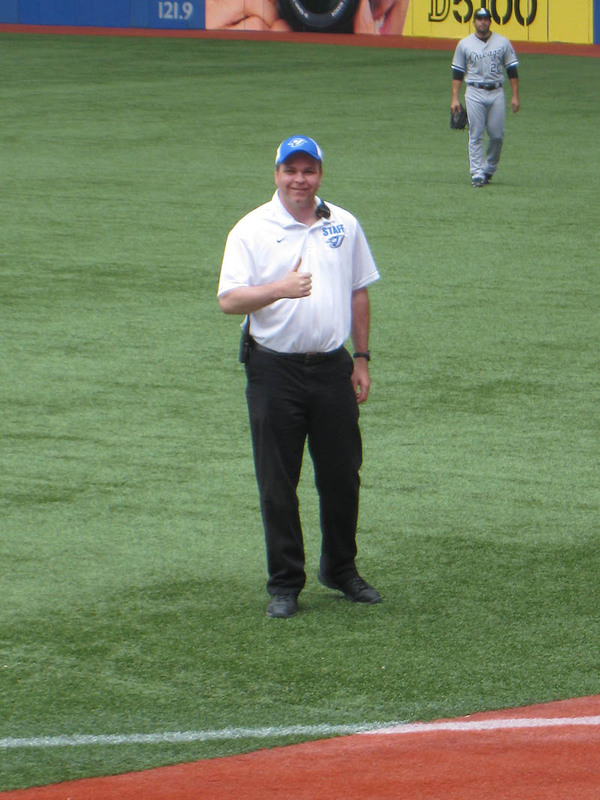 …and on the pitch that was thrown immediately after I took that photo, Ramon Castro hit a two-run homer. That made it a 13-4 game, and that was the final score. 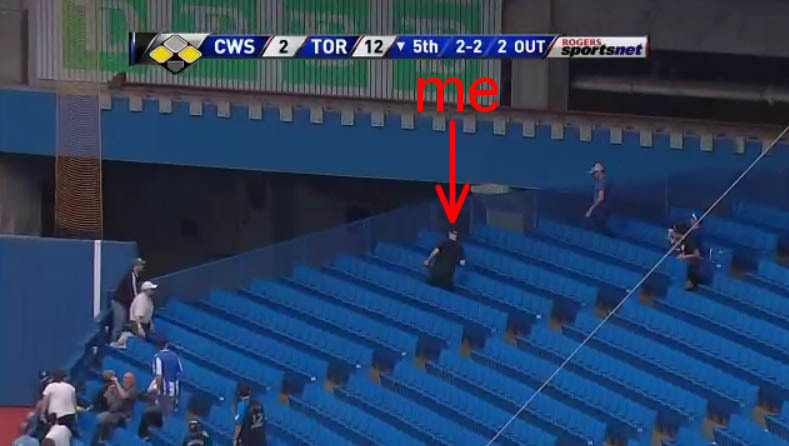 After the final out, I moved down to the front row. Can you find me in the following photo? I snagged two more baseballs there. The first was thrown by home plate umpire David Rackley, and the second was tossed by a White Sox bullpen coach who was wearing No. 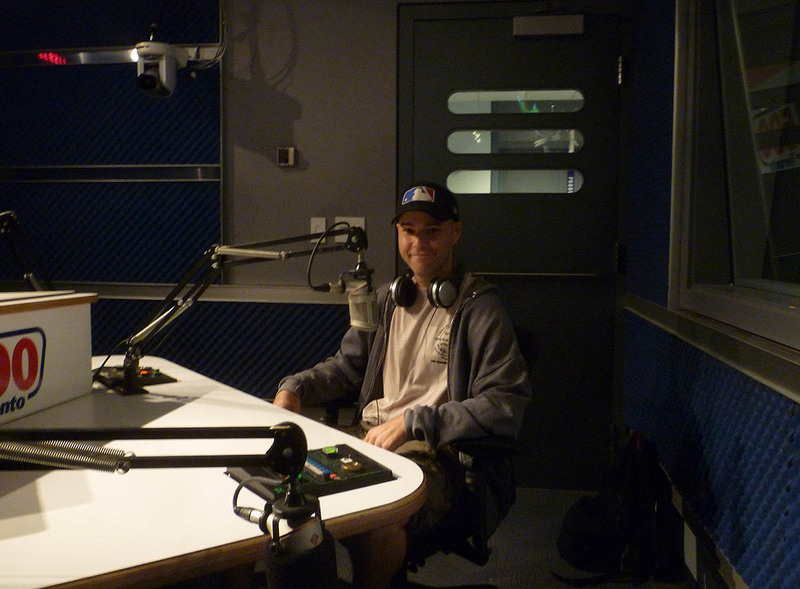 73. Does anyone know who that is? He’s not on the roster. He looked to be about 50 to 60 years old. He has a gray-ish mustache. I think he’s Latino, and he walked in with bullpen catcher Mark Salas. Anyway, that gave me 10 balls for the day. Double digits, baby! Back at the hotel, I had an hour to kill before leaving with Andrew for the airport. We’d already checked out that morning, so we hung out in the lobby and used the free WiFi. Among the many emails waiting for me in my inbox (many of which I still haven’t had a chance to answer), there was an interview request from a reporter named Tristan Hopper with the National Post. (The Post did a huge feature on me in 1999, BTW.) He wanted to get a quote from a “baseball expert” about Jo-Jo Reyes’s near-record-breaking losing streak. Long story short: I emailed Tristan, he called me back, we did a quick interview, and the following day, my name/quotes appeared in the paper. Here’s an online version of the article, in case you want to check it out. And wouldn’t you know it? Reyes ended up pitching (and winning!) a complete game on the same day that the article was published. I must be good luck. • 353 balls in 41 games this season = 8.61 balls per game. 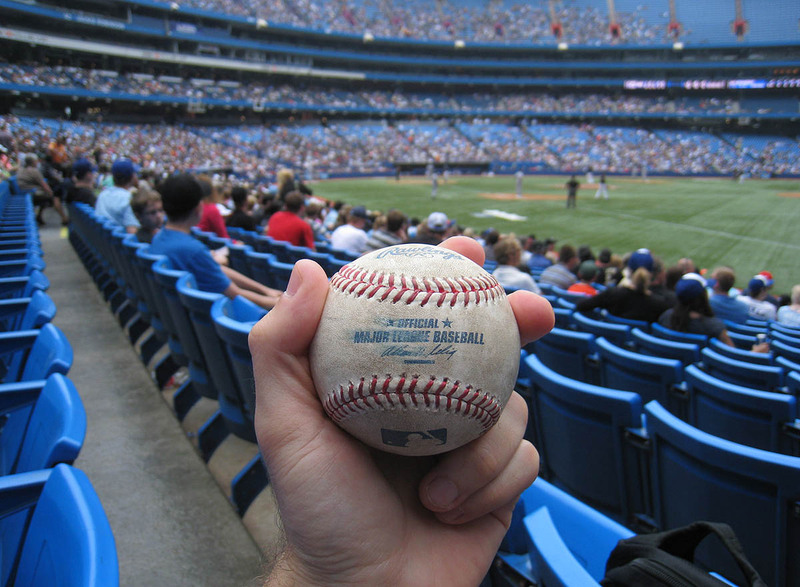 The foul gods finally let you get a foul ball. All right! Do you know where you’re going next? 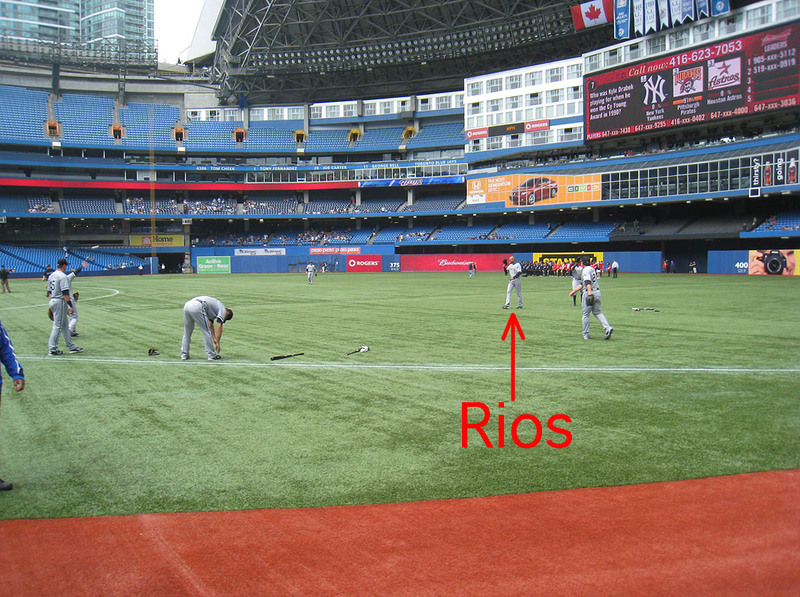 Rios was an easier auto when he played in Toronto. He stayed at the Renassance for the first part of his career there. The White Sox were one of the few AL teams that also stayed in the hotel (most had other affiliations in the city before ’89 when the stadium was built and the hotel went live). When Inworked there 5 hrs ago I checked Konerko in and spoke with Ozzie etc. Not sure if they still stay there but Jennifer will know and she will also have good intel on Rios. She knows all the players and will be able to tell you how to hook up with him next time the Sox are in T.O. I was wondering 2 things. 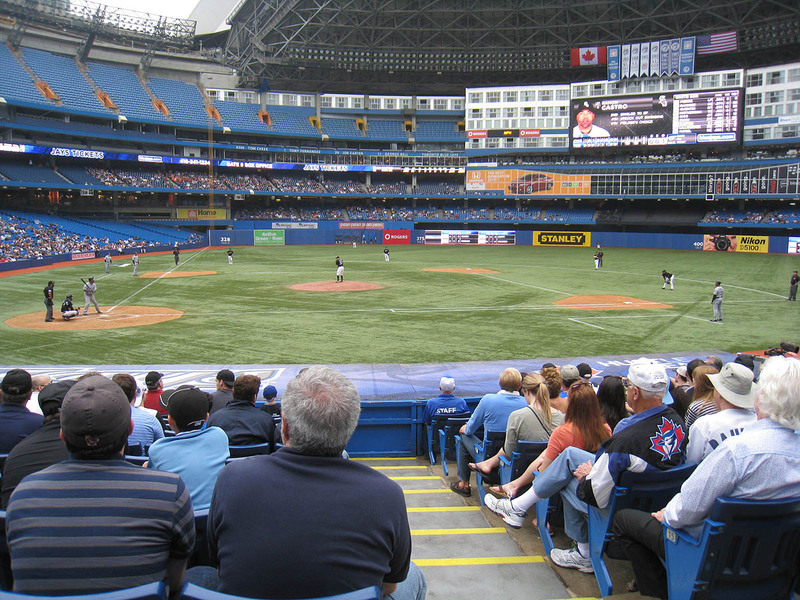 One, how many baseball games have you gone to in your enire life? How many of those games idid you reach double digets in baseball? Sorry, I meant how many of all of the games that you have gone to, have you reached double digets in baseballs? awesome series. great seeing you! 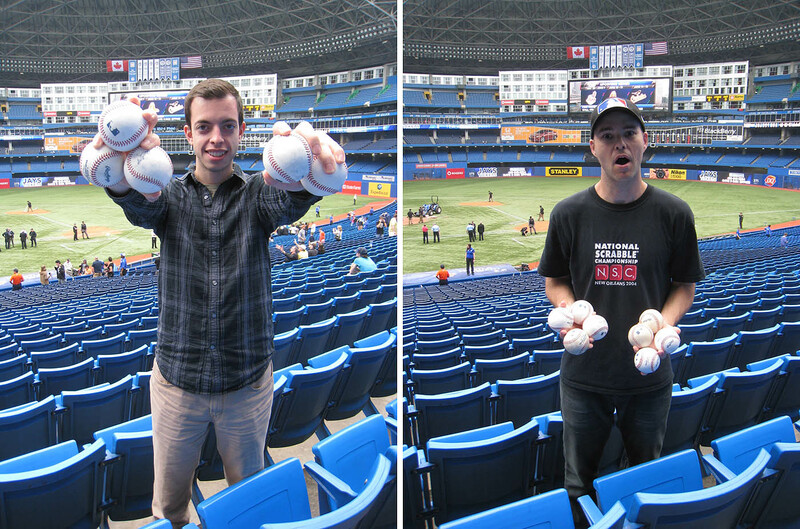 Fun to read about your adventures in Toronto, and good job with the milestone ball and the Bautista foul — super cool! I’ve never had luck with Rios through the mail or in person, so I definitely wouldn’t try the mail approach, especially with a ball so important. I might watch for a Chicago-area show in which he’s signing; these shows often accept items by mail, so that might be an option. Two hands up. Oh… and a nice entry too. Damn. Alex Rios needs to learn NOT to respond to people. Why yes. Yes, they are. 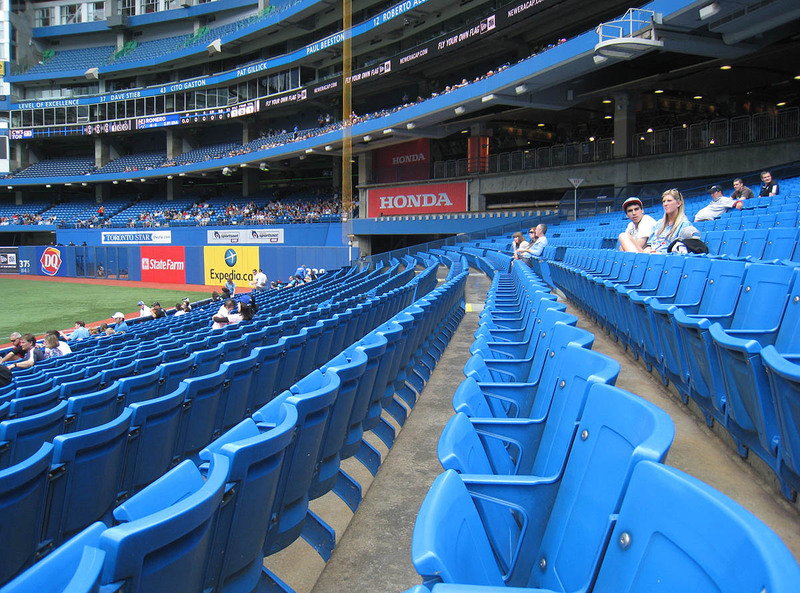 Citi Field all this week. Maybe Baltimore early next week. Denver and Seattle after that. Fenway in late June. And so on. Cool, thanks for the info and insights. I’ve hit double digits at 150 different games, and I’ve been to about 880 games overall. I think. I know the exact number of balls that I’ve snagged, but when I was little (and not yet snagging baseballs), I didn’t keep track of every game I attended. Great seeing YOU. 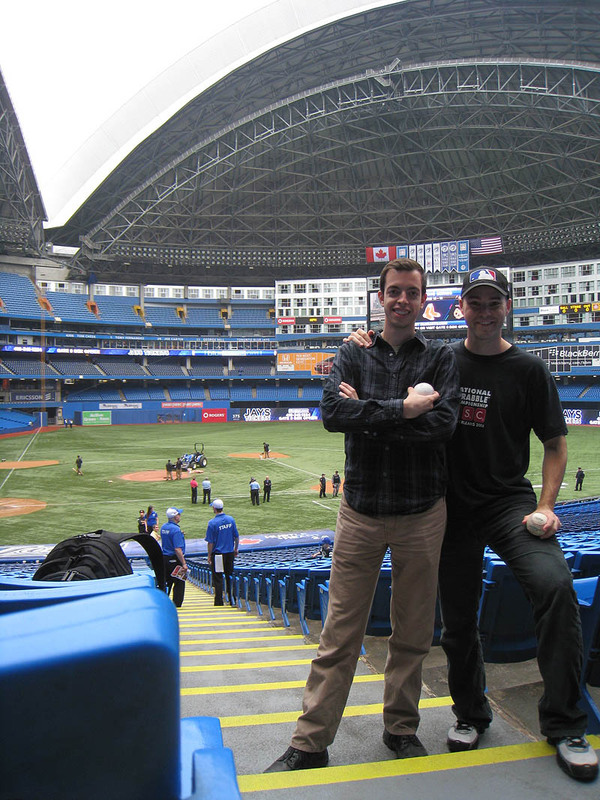 You made the Rogers Centre extra fun for me, so thanks for that. Juan Nieves! Yes! I should’ve remembered. He tossed me a couple balls in Arlington two years ago. Okay, thanks. No mail. Got it. I’ll keep my eyes peeled for shows. Thanks, but I try to avoid games when there are gonna be a zillion kids.